Editor's note: More than 1.2 million acres are currently burning across much of the West, Alaska and Florida. In California, the Carr Fire in Shasta County has scorched more than 100,000 acres, and the Ferguson Fire has driven tourists out of Yosemite National Park. Photojournalist Michael Kodas, deputy director of the University of Colorado's Center for Environmental Journalism, has worked as a wildland firefighter and is author of "Megafire: The Race to Extinguish a Deadly Epidemic of Flame." Here, he describes the challenges of fighting these intense blazes. The Carr Fire doubled in size twice in just several days. What kind of conditions can make this happen? There are lots of drivers. Fuels like timber and grass, drought to dry them to the point of combustion, and high temperatures that help flames spread quickly are usually involved. The Tubbs Fire, which burned into Santa Rosa in 2017, was counterintuitively set up by a break in California's drought during the previous winter. That pulse of moisture allowed a burst of what firefighters call "one-hour fuels" -- grasses and other fine vegetation that grow fast, but can be dried to the point of burning in an hour when drought conditions return. California's drought has also killed more than 100 million trees, which can stoke more intense fire behavior. Dead needles on coniferous trees killed by drought can act like fine fuels, spreading fire rapidly through the crowns of the dead trees and igniting heavy timber below them. In the field with the Geronimo Hotshots, an elite crew of Apache firefighters in southeastern Arizona. What does it mean when reports say a fire is 10 percent or 20 percent controlled? Can that erode if a fire spreads in unexpected ways? 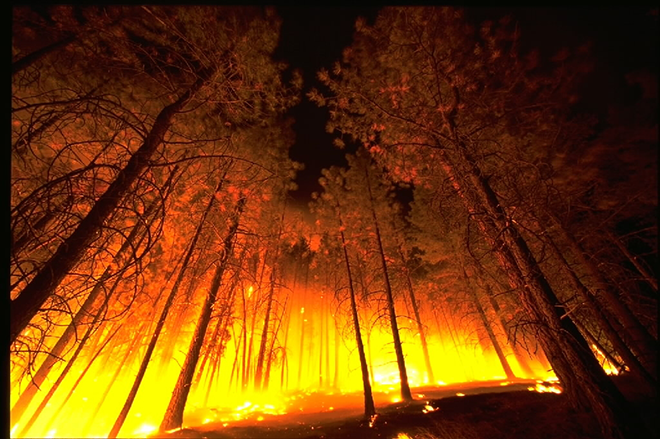 In the United States we fight wildfires more often with dirt than with water. Containment usually describes the percentage of the blaze surrounded by a fire line - a perimeter around the fire that's been dug down to mineral soil, leaving no fuel to carry the fire across the line. Fire lines can join together other barriers, such as paved highways and rivers, to corral the blaze. But strong breezes behind a wildfire can launch fire brands a mile or more to ignite timber, grasses or even communities on the other side of the containment line. So a sudden wind change can push a blaze across a fire line that otherwise would have held it back. Three firefighters have died on the job in California in the past several days. Do you think this work is becoming more dangerous in a warming world? Climate change is definitely magnifying some of the hazards that firefighters face, but rapid development in the West is probably a bigger factor. The U.S. Forest Service estimates that more than one-third of all U.S. homes are in the wildland-urban interface - the area where development abuts flammable open space, and houses are at risk of burning in a wildfire. Out of necessity, the nation is prioritizing fighting wildfires close to communities and infrastructure. So firefighters who once only had to worry about the hazards of fires burning through forests now also have to contend with threats like power lines and fuel tanks. When I recertified my wildland firefighting credentials a few years ago, the test included questions about what to do if I found a meth lab or an illegal chemical dump while fighting a forest fire. Human nature is also a factor. It's much easier to step back from a fire that's behaving unpredictably if it's just going to burn a stand of trees than if it might destroy homes or take lives. Protecting communities can push wildland firefighters to take more risks. It's important to understand that wildland firefighers are not equipped or trained to fight structure fires. They wear lightweight fire-resistant yellow shirts and green pants that allow them to walk long distances in the forest quickly, not heavy coats and pants like structure firefighters. They don't carry tanks of air to breathe in the heavy, often toxic smoke of structure fires. They don't have heavy gear such as ladder trucks, and often they are too far from their vehicles to rely on them to escape a dangerous scene. What draws people to become wildfire fighters? When I spent a summer working in wildfire, many of the young men and women I worked with were college students enjoying an exciting job in the outdoors that paid well enough to help finance their higher education. Now that the fire season has expanded by more than two months, largely due to the warming and drying climate, fires are burning at times of year when they are still in school. So a much higher percentage of full-time U.S. Forest Service employees have to focus all or part of their work on wildfires. Over the last decade people involved in wildfire have complained that the Forest Service is turning into a Fire Service. In 1995, about 15 or 16 percent of the agency's budget was spent preparing for, fighting and recovering from wildfires. Last year 56 percent of the service's budget was spent on wildfires. People still get involved with wildland firefighting, particularly as seasonal firefighters, because they enjoy a sometimes adrenaline-rich job that lets them spend days in the forest with an axe or a chainsaw. There's a camaraderie among wildland firefighters that's hard to find in other careers outside of the military. The work is physical enough to keep hotshots and smokejumpers, the nation's most elite wildland firefighters, in terrific shape. And the money is good enough to spend off-seasons traveling, skiing, climbing or surfing, so it's a great job for outdoor athletes. You're based in Colorado, which sees a lot of fire. Do you see much support for limiting development in fire-prone areas in the West? It's profoundly difficult. Counties are often reluctant to turn away development in dangerously flammable areas because they get tax benefits. They know they won't have to pay for suppressing disastrous wildfires, because taxpayers fund the Forest Service's work. Developers often push back against common-sense building codes, like requiring fire-resistant materials and cutting fuel breaks around homes, because those options are usually more costly. The insurance industry has started to include wildfire risk, use of firewise building materials and emergency planning in its premiums. But some companies offer special policies that send private fire crews to protect insured homes, rather than declining coverage or pricing it in a way that encourages safer development patterns or more fire-resilient construction.